Goodness where has the time gone! I have truly, truly wanted to post. In fact, I’ve had this recipe waiting in the wings (and it’s a good one…recipe below!). But, as you can imagine, our little H has taken center stage and with it all our attention. He is a sturdy fellow, with the most intense stares, complete with knitted brows and serious demeanor. Like his sister and his mama, he was born with hardly any hair at all, just a soft fuzz, like a peach, a sign of what will eventually be curly hair (also like his sister and mama). He sleeps a little bit more than little C did, which isn’t saying much, so suffice to say that he is not one of those babies that spend the whole day sleeping. And I am resigned to the fact that I will never have those fabled, and much coveted, babies that do nothing but sleep. On the whole, I am more relaxed now I think. With little C I was a first time mama, I didn’t know anything and everything seemed mysterious. Now, I have a bit more experience and let more things just be. I feel that this makes the baby more relaxed too. On the other hand, we are still in new territory – that of having a toddler and a newborn together. Which is a whole other escapade, not without its challenges, but also with such wonderful magical moments. Adventuring with our now family of four is something C and I look forward to. Little C is enamored with her baby brother. Everything about him is paid minute attention – his little handsies and feeties, why is he crying, what is he doing, can I say goodnight. I especially love how she mimics us when he cries – patting him and saying in her best soothing grown-up voice “it’s ok, it’s ok, don’t cry, mama’s here”. Even then though, I know she needs extra attention during this time, which we try to make sure she has. She has been a trouper, all things considered. I couldn’t be prouder of both my babies. In all this however, blogging has had to wait by the side for a bit. But I miss it too. It is, after all, my third baby, one that I have nurtured for almost 8 years. So I will never be too far away for too long. I love it too much for that! So, without further chat, here’s an Asian style chicken braise that I hope you and your families enjoy as much as mine does. – Heat a heavy based casserole or pot over medium high heat. When hot, add a few swirls of oil until it coats the bottom of the pan thinly. When the oil is hot add the onion, garlic, and ginger and sauté until the onion is soft and translucent. – Add the chicken and brown on all sides, although you do not have to be even or uniform about it at all. Just fry until bits of the skin and meat have turned golden brown in places. – Add the mushrooms and chorizo/sausage and turn so that everything is well mixed. Add the soy sauce, oyster sauce, Shaoxing, sesame oil, and sugar, and toss to get everything coated. Add enough water to cover the chicken a little more than halfway. Cover the pot and let this simmer until the chicken is tender, about 45 minutes – 1 hour. – Serve with lots of steaming hot rice! I’ve dubbed this Asian-style as I can’t really say with full authority that this authentically falls into one particular Asian cuisine, although it does use a lot of Chinese ingredients. The best part, aside from packing a punch flavor-wise, is that it is very easy to prepare. A one-pot meal whose taste far surpasses the effort you put in to make it. You can use regular Chinese chorizo/sausage here, but if you are able to get your hands on some Hong Kong goose liver sausage it will take the dish to a whole other level of deliciousness. Little H is about to nap, and I will soon be out to pick up little C from pre-school. The sun is shining for now (it’s been raining for the past couple of days), and the trees outside my window are looking bright and happy. I am running on, literally, a couple of hours of sleep but I take pleasure and contentment from these little and big blessings…for which I am so grateful. Absolutely scrumptious! This dish is really appetizing. Ooooh I want this braised chicken! This looks so yummy. I like your recipe and will try it soon. Enjoy parenthood. Those two sound so cute! Thanks for sharing this recipe inspite of your busy schedule, J! And I definitely want to cook this recipe; it seems like the perfect thing to have on a cold, rainy night. Sounds as though you have a little old soul on your hands 🙂 And Little C is making all big sisters everywhere proud! Yes – 1 kilo of ginger… ! That's a good chicken!! I'm happy for you for your baby!!! I'm happy to hear from you that being mom for the second time it's easier than the first!my dougher would like a little brother or sister :)have a good day! Hi Betty Ann! Thanks! Hope you like it! This is the kind of homey, braised, Asian-flavored dish that I love! Awww, I can imagine how Little C is of her brother. 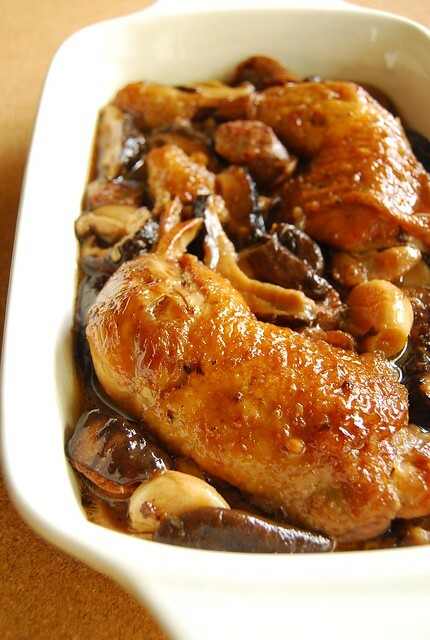 I can also imagine how explosive the flavor of this Asian-style Braised Chicken with the chorizo and the shiitake mushroom! I like your recipe and will try it soon. Enjoy parenthood. This chicken recipe looks yummy. Can't wait to try it soon. So good! It looks very tasry!